The ACC Network is going to become a reality next year. ESPN announced this week that it will launch its new college sports network Aug. 22. The network’s first college football broadcast will feature Georgia Tech on the road against Clemson on Aug. 29 for a Thursday night showdown. 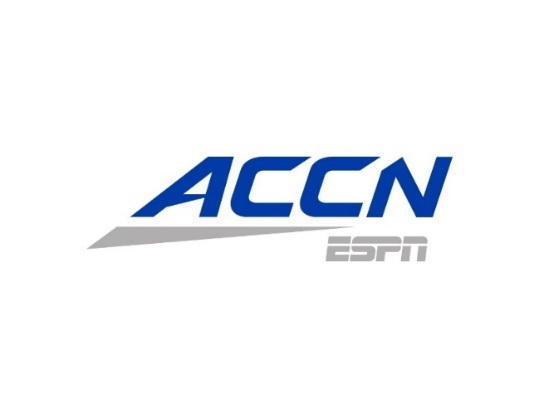 According to a news release from ESPN, the ACC Network is expected to broadcast 1,300 live ACC events annually on its TV and digital platforms. Those events will come from all 15 of the conference’s schools and 27 sponsored sports. ESPN President and Disney Media Networks Co-Chairman James Pitaro said he is optimistically anticipating the network’s launch. ACC Commissioner John Swofford echoed Pitaro’s comments in a prepared statement. The ACC Network’s first TV spot is scheduled to air live Dec. 1 during the Dr. Pepper ACC Football Championship game. The game is scheduled to air at 8 p.m. ET on ABC. More information on the ACC Network is available online now at http://www.getaccn.com. Two of college football’s Top 10 teams will headline this week’s college football broadcast schedule across the ESPN networks. No. 3 Notre Dame and No. 10 Miami will go under the lights Saturday night on ABC’s Saturday Night Football presented by Wells Fargo. Saturday’s matchup marks only the fourth time that Notre Dame and Miami have faced each other since 1990 and the first time Miami has hosted Notre Dame since 1989. Saturday’s matchup has plenty of key story lines. Notre Dame running back Josh Adams is working hard to make his case for the Heisman Trophy this year. So far this season, he has racked up almost 1,200 rushing yards and nine touchdowns. The Fighting Irish’s head coach Brian Kelly has led a dramatic turnaround for the team this season, too. After finishing last season at 4-8, this season has seen the team go 8-1 so far. Miami head coach Mark Richt is in only his second year at the Hurricanes’ helm, has the team in the national spotlight for the first time in more than a decade. While the Irish and ‘Canes are the headliners for this week’s ESPN networks college football broadcast schedule, it is only one of the games on that extensive schedule. The networks’ Week 11 coverage opens Tuesday, Nov. 7 with a double header as Miami (Ohio) hosts Akron on ESPN2 and Buffalo hosts Bowling Green on ESPNU. Coverage of both games is scheduled to start at 7:30 p.m. The action continues Nov. 7 with another double header on ESPN2 and ESPNU respectively. Toledo and Ohio are up first at 7 p.m. on ESPN2. Eastern and Central Michigan follow at 8 p.m. on ESPNU. North Carolina is on the road Thursday against Pittsburgh, with coverage starting at 7:30 p.m. on ESPN and ESPN Radio. Over on ESPNU, Appalachian State plays host to Georgia Southern beginning at 7:30 p.m.
Friday will see yet another double header with the struggling Cincinnati Bearcats hosting the Temple Owls at 7 p.m. on ESPN2 and UNLV hosting BYU at 10:30 p.m. on ESPN2. Saturday sees lots of action beginning at high noon as No. 15 Iowa State hosts No. 11 Oklahoma State either on ABC or ESPN2. Seven more games are also scheduled across the networks at noon including games on ESPN Radio, the SEC Network and ESPN3. This week’s action winds down Saturday night at 10:15 p.m. on ESPNU as Wyoming plays on the road against Air Force. The ESPN networks’ full college football week 11 broadcast schedule is noted below. The start of Week 8 in college football’s 2017 – ’18 season is almost here. Week 8 starts with a Thursday night double-header schedule. Arkansas State plays host to Louisiana live at 7:30 p.m. on ESPNU to open the night. That game will be followed at 8 p.m. on ESPN with Houston playing host to No. 25 Memphis. The weekend’s action continues Friday night with another double-header schedule beginning at 7 p.m. on ESPN2 as Marshall plays on the road against Middle Tennesse. Colorado State and New Mexico follow at 10:15 on ESPN2. Saturday offers a jam packed, near daylong schedule that will be headlined by a matchup of No. 19 Michigan at No. 2 Penn State live on ABC’s Saturday Night Football presented by Wells Fargo. Coverage of the game is scheduled to start at 7:30 p.m.
Saturday’s game carries big implications for the Nittany Lions. The team upset then-No. 2 Ohio State in what has come to be its “White Out” game live on Saturday Night Football. That win would be the precursor to the Nittany Lions’ Big 10 Championship and Rose Bowl appearance. The win also would be Penn State’s ninth consecutive win on the season. Michigan is the last Big 10 team to defeat Penn State, going back to Sept. 2016. The team also has the edge on Penn State, winning the teams’ last three matchups. While the Wolverines and Nittany Lions are the headliners for the ESPN networks’ college football week 8 schedule, they are not the only teams that will play live across the networks this weekend. No. 10 Oklahoma State and Texas open Saturday’s schedule at noon on ABC. No. 18 Michigan State will play host to Indiana at 3:30 p.m. on ABC while No. 24 LSU will be on the road against Ole Miss at 7:15 p.m. on ESPN. The full schedule for the ESPN networks’ coverage of Week 8 in college football’s 2017 – ’18 season is noted below.